The concert was conducted by Mairéad Déiseach. The presenter was Shane Morgan. He introduced every song and performed two songs himself. They were called A Million Dreams and An Elvis Presley medley. The concert was around 1 hour and 45 minutes. It was a fun night at the end of it all and a great experience. We would recommend it! [/et_pb_column][/et_pb_row][/et_pb_section]Together we sung 15 songs including Starman, O Fortuna, Kusimama and Listen to the Rain. [/et_pb_column][/et_pb_row][/et_pb_section]There were 5 other schools singing on the same night with a total of 490 children performing. Together we sung 15 songs including Starman, O Fortuna, Kusimama and Listen to the Rain. Last week 5th and 6th class did the National Children’s Choir on Tuesday night. 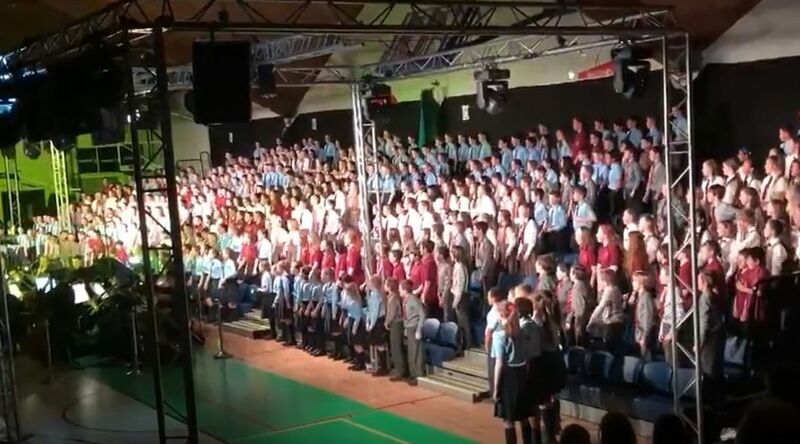 There were 5 other schools singing on the same night with a total of 490 children performing. Together we sung 15 songs including Starman, O Fortuna, Kusimama and Listen to the Rain.